This article was updated at 4:25 p.m. EST. A little-known law soon could restrict top acting officials across the federal government and possibly leave the Trump administration's coming environmental and energy policy decisions legally vulnerable. In the crosshairs are acting officials who have been serving in Senate-confirmed positions at agencies like U.S. EPA and the departments of Energy and the Interior that have no nominee waiting in the wings. Those officials — including the acting heads of the Bureau of Land Management and the Fish and Wildlife Service — are allowed to serve only 300 days under the Federal Vacancies Reform Act if their positions have been vacant since Inauguration Day. That clock runs out next Thursday. "The Vacancies Act is going to come whole cloth across the federal government like a big biblical changing of the guard," said Terry Sullivan, a political scientist at the University of North Carolina, Chapel Hill, and executive director of the nonpartisan White House Transition Project. So what happens after the deadline comes next week? It's complicated. Under the law, Senate-confirmable offices without nominees will not be able to perform the office's specific duties or functions assigned under statute or regulation, according to a recent Congressional Research Service report. Acting officials who violate the act could see their decisions later challenged and possibly reversed in court, the CRS report warns. That could offer a valuable opening for foes eager to take a scalpel to Trump administration rulings. But experts say it's not entirely clear whether or how the administration will carefully step around the issue. "It's a peculiar set of circumstances," said Steven Aftergood, director of the Project on Government Secrecy at the Federation of American Scientists. "If an official takes some kind of action that he or she is no longer authorized to do, it might take a lawsuit from an affected party, like someone who's being regulated, to block that action." Violations may hinge on the exact mechanics of regulatory sausage-making at each agency — the formal chain of command and statutes governing specific rules — as well as the ability of regulated entities or nonprofits to sue, said Paul Light, a public policy professor at New York University. But the legal threat, he emphasized, is real. "You can tie up an administration forever by challenging illegal actions made by people who are performing the duties of an acting without actually being appointed as such," Light said. "I'm saying it's very serious. If they understood the law, they would be taking it seriously because the failure to pay attention to the statute would undermine their ability to 'undo' as well as 'do'." The act appears poised to strain the decisionmaking ability of acting officials stationed in more than two dozen empty Senate-confirmable posts at EPA as well as the departments of Energy and the Interior. EPA officials say they're not concerned about the change in responsibilities for the agency's acting officials affected by the Vacancies Act's deadline. "I'm not worried about legal vulnerabilities about the fact that people cannot be acting AAs if there are no nominees. We know how to lead the agency and the programs, notwithstanding the limitations on who can be acting at a particular time," Kevin Minoli, EPA's acting general counsel, told E&E News. "On the 16th, no one can be acting. That's consistent with our understanding." According to the Partnership for Public Service, a nonpartisan government research group, acting officials will be affected regardless of whether they began filling their roles directly after Trump moved into the White House in January or later this year. That's because the 300-day clock starts ticking when a vacancy occurs following the first-term inauguration of a president — not when an acting official begins serving. Kristine Simmons, vice president of government affairs at the Partnership for Public Service, said government work could be affected. "The work of the federal government will go on, but big decisions may be put on hold. Senior career employees in acting roles are less empowered, and less comfortable, making major or long-term decisions," Simmons said. Some agencies' Senate-confirmed officials, like chief financial officers and inspectors general, are exempt from certain provisions of the act to keep their functions independent from agency heads. When the Vacancies Act's 300-day clock runs out during a transition year, no officials can act in the empty office without a nominee named. An official can perform the nonexclusive duties of a Senate-confirmed position but cannot do its exclusive functions, which are assigned to that specific office by law or regulation. Agency heads then may have to step in to perform those exclusive duties. While acting officials may be shuffled out and the offices left empty, past experience shows that violations do occur. The Government Accountability Office, for example, has tracked 20 violations of the law by agencies since 2000. At Interior, at least three high-profile acting officials who have already had a hand in public lands issues could see change. 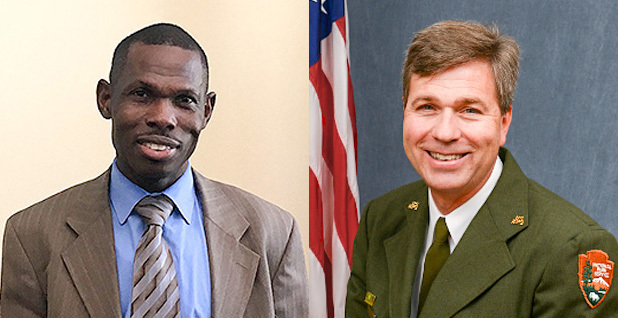 Mike Nedd, a former Army special operations officer, was named acting director of the Bureau of Land Management in mid-March, and President Trump has yet to name a nominee (E&E Daily, March 16). Greg Sheehan, a former Utah state official, was acting Fish and Wildlife Service director for part of the summer. Career FWS employee James Kurth is now the current acting director; there's no nominee to replace him. Career National Park Service worker Michael Reynolds has been identified as acting director since at least March. He is a non-political holdover, having been named deputy director of operations in August 2016. There is no nominee yet for his job. When asked about Vacancies Act issues, Interior spokeswoman Heather Swift said "we are aware of the deadline and we have taken sufficient administrative actions to ensure that the functions, duties, and responsibilities of the positions are performed." But former Interior Solicitor Hilary Tompkins said today the agency could face potential challenges, noting some work cannot be delegated. "There will need to be a legal determination as to what functions in the areas of offshore and onshore energy development, protection and management of park and refuge lands and species, and fulfillment of trust obligations to Indian tribes, are exclusive to those positions," she said. A handful of acting officials could also see a shift at DOE, including Dan Simmons, who was tapped to serve as acting assistant secretary of the Office of Energy Efficiency and Renewable Energy at the beginning of May. The $2 billion office has been a hub for renewable energy research, facilitating declining costs for solar. The Trump administration in its fiscal 2018 budget proposal floated a 53 percent budget cut for the office. Also potentially in flux is John Stephen Binkley, a career official who was tapped to serve as DOE's acting director of science. Trump has yet to name a nominee for the office. Acting officials are also leading DOE's offices overseeing nuclear power, the cleanup of sprawling Cold War-era weapons production sites, international affairs and other posts. EPA also has several career employees serving in the agency's top political posts on an acting basis since Inauguration Day, as named in an internal memo before the changeover in administrations. Administrator Scott Pruitt and Bill Wehrum, picked to lead EPA's air office, are Trump's only Senate-confirmed officials at the agency. Wehrum was confirmed just today by the Senate (see related story). At least five of those acting officials could be fully impacted by the looming deadline under the Vacancies Act since Trump has not offered up nominees for their positions. Donna Vizian has been serving as acting assistant administrator for administration and resources management at EPA since Jan. 20. Steven Fine has been acting chief information officer, and Jane Nishida has been acting assistant administrator for international and tribal affairs. Since January, Barry Breen has been EPA's acting assistant administrator for land and emergency management, which oversees the toxic waste site cleanup program known as Superfund, a Pruitt priority. Trump also has not nominated someone to lead EPA's Office of Research and Development. Jennifer Orme-Zavaleta replaced Robert Kavlock as acting research chief when he retired earlier this month. There is also no nominee waiting to replace David Bloom, EPA's acting chief financial officer, but as the agency's top financial official, he is exempt from certain provisions of the Vacancies Act. The president has nominated people to lead EPA's air, chemicals, enforcement, general counsel and water offices as well as for deputy administrator. Acting officials can then hold onto those jobs as long as those nominations are pending before the Senate. Regarding its acting officials affected by the Vacancies Act, EPA spokeswoman Liz Bowman said, "The agency fully intends to operate in a manner that is consistent with the law." "We hope the Senate will provide EPA with the necessary leadership to implement the president's environmental agenda to protect our nation's air, land, and water. In the meantime, existing career and political staff will continue to work together to lead the agency's programs consistent with the authority provided by the law," she said. Bowman added that Pruitt may have to perform some functions at the agency past next week's deadline as acting officials return to their prior jobs. "Unless the administrator chooses otherwise, the career officials currently acting will return to their normal deputy positions and continue to perform the non-exclusive duties of the position," Bowman said. "To the extent there are any duties that are exclusive to the [Senate-confirmed] position, the administrator would perform those duties. These are extremely limited and the need to exercise them happens rarely." Minoli said EPA will be working with its program offices that have vacancies to ensure they're in accordance with the law. "Each office is affected differently because some do and some do not have a nominee. So we will be working with each office for their specific situation," Minoli said. Reporters Michael Doyle and Christa Marshall contributed.